Prof. Wang Ming is one of the leaders of NGO (non-governmental organization) studies and environmental governance in China. He founded the Tsinghua University NGO Research Center to introduce NGO studies to China, and also opened up the new academic field of Philanthropy. He has raised academic standards in this field in China, through field surveys which he considers vital, and by introducing socio-scientific methods from abroad. He has also educated many young researchers. For his continual commitment to the potential inherent in NGOs and to their application in the solution of social and environmental problems, Prof. Wang is truly worthy of the Academic Prize of the Fukuoka Prize. Prof. Wang Ming is a leading scholar specializing in NGO (non-governmental organization) studies and environmental governance studies, which have attracted increasing attention as China’s economy has grown. After returning from Japan where he had studied, he started to teach at Tsinghua University in 1998, and about the same time, founded an NGO research center as the first such institution in China. NGO studies is a new academic field which examines the activities, organization, networking, and policy/institution-making of the diverse NGOs that were founded from the 1990s. It also aims to facilitate the development of stable civil society. Prof. Wang is one of the pioneers opening up this new field. Prof. Wang was born in Urimuqi in 1959, and graduated from the Faculty of Economics, Lanzhou University. In 1992, he came to Japan. After studying at the University of Fukui and Kyoto University, he started the doctoral program at the Graduate School of International Development (GSID), Nagoya University, and received his Ph.D in 1997. In 1998, he founded the NGO Research Center, Tsinghua University, and became its first Director. He was also appointed to a succession of important posts including Director Member, Council, Red Cross Society of China (2004－), Vice President, China Foundation for Disabled Persons (2006－ ) and Chairman, the Board of Directors, Mingde Philanthropy Research Center (2012－), and has involved himself in solving social problems and strengthening civil activities and civil society. Furthermore, he has opened up and prompted a new research field of Philanthropy. He was instrumental in founding the Tsinghua University Institute for Philanthropy, in 2015, and became its Dean. Prof. Wang's involvement in society has been based on strong academic foundations, the numerous field surveys which he has conducted with his colleagues and junior researchers. He serves as chief editor of the series in which the findings from these studies have been compiled, Case-Studies on China's NGOs and Wenchuan Earthquake: China NGOs in Emergency Rescue. 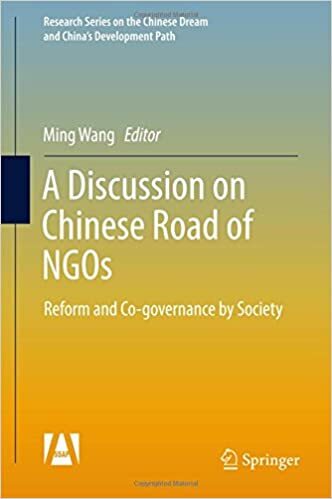 Recently he interviewed approximately 100 leaders representing NGOs in China, and the survey results were presented in the publication of Oral History for NGOs in China (Vol. 1, 2012; Vol. 2, 2014). They will provide the academic foundation for future NGO studies and NGO activities in China. During the last decade, Prof. Wang has visited various countries and regions including Germany, Japan, the U.K., the U.S. and Hong Kong to investigate the status of their NPOs in order to introduce international NGO studies to China, and to establish the subject on a more objective and socio-scientific academic basis. He wrote five books based on these surveys (NPOs in Germany, NPOs in Japan, NPOs in the U.K., etc.). There is no doubt that these academic initiatives have greatly enhanced the standard of NGO studies in China. At the same time, educational programs provided by the NGO Research Center and the Tsinghua University Institute for Philanthropy have made an invaluable contribution to helping many junior researchers. Following Prof. Wang's footsteps, many of his young protégés came to Japanese universities to study NGOs and civil society, and they are now leaders in the field. Prof. Wang's much-praised achievements as an educator were nourished by intensive exchanges between China and Japan, and he is an outstanding example of the value of these exchanges. China and Japan will be cooperating even more in a variety of fields such as critical environmental problems and infectious diseases in China. Under such circumstances, Prof. Wang's academic and educational achievements have played an important role in facilitating cooperation between China and Japan. For all these eminent achievements, Prof. Wang Ming is truly worthy of the Academic Prize of the Fukuoka Prize. Public lecture will be held at Main Hall, ELGALA HALL by inviting Prof. WANG Ming, laureate of the Academic Prize. Admission is free. We hope you will join us there.